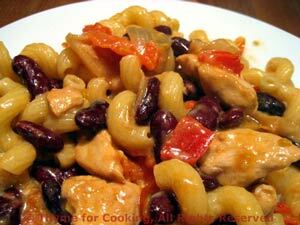 Pasta with Chicken, Red Pepper and Red Beans, from Thyme for Cooking's seasonal menus. This is a simple dish to start the week; just a few ingredients and it goes together quickly. Red pepper, red beans and a few of the last fresh tomatoes come together for a quick sauce for pasta and sautéed chicken breasts. Delicious doesn't have to be difficult! Roughly chop the pepper, onion and tomatoes. In a large skillet heat oil. Sauté paprika for 1 minute. Add onion, pepper and sauté for 5 minutes. Add garlic, sauté 1 minute longer. Add tomatoes, stock, beans; simmer until tomatoes soften and sauce starts to thicken, 5 - 10 minutes. Pour sauce over pasta, stir well to combine and serve.